The IT infrastructure market has seen an era of rapid transformation in recent years. The growth of public cloud in the enterprise IT segment, the emergence of new suppliers into the IT infrastructure market – both OEMs and ODMs – and the shift in spend from traditional IT suppliers to new ones, are all important changes affecting suppliers and buyers in this market. Within this transforming market, one segment of particular interest is the service provider market, who are operating an infrastructure platform to deliver IT and non-IT services to end customers in an "as a service" model. The service provider segment has been the fastest growing segment of buyers in the server and storage hardware market for the past few years. But the pattern of IT infrastructure consumption by service providers is slowly diverging from that of traditional IT enterprises, who have historical formed the largest segment of buyers in this market. This includes shifts in preferences of storage and server systems used in their deployment, as well as shifts from owned infrastructure to pay-as-you-go infrastructure (like IaaS and PaaS) for their computing and storage needs. IDC's Cloud Infrastructure Index is a recent study that brings together qualitative and quantitative insights into consumption by the top hardware buyers in the service provider market. 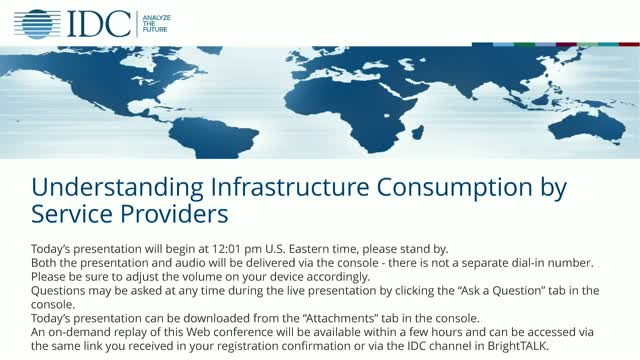 This IDC Web conference provides a summary of key insights from this study, and introduces a framework that helps understand IT infrastructure related decisions by the growing service provider market.